Kursk it brings to mind nebelwerfers and Stalin's organs screaming, but most of all the oily pall of burning tanks. That one sentence sent to Koba, "the tigers are burning", was supposed to have summed it up. The only question is, did it really happen? Was the Panzerwaffen destroyed on July 12th 1943 at Prokhorovka, or are the earlier histories all wrong, and the true history is very different. 'Demolishing the Myth' looks to answer that question. Kursk is probably the second most written about battle following Waterloo. The tank battle at Prokhorovka has been stated many times to be the largest tank battle in history. Unfortunately, due to Soviet propaganda and other untruths, it has been very hard for historians to peel back the layers and find the truth about Kursk. The actual battle of Prokhorovka has been wrapped even tighter in an impenetrable fog than the rest of the Kursk battle. Long known as the 'death ride' of the panzers, Prokhorovka was really much smaller in scale than was imagined. Only in some Soviet dreams was the ground littered with burned out panzers. That is not to say that the fighting was not bitter and to the death, as was all the fighting in the Kursk salient. I want to stress that point. Just because we now know that Dubno in 1941 saw the greatest amount of tanks in one battle, with approximately 5,000 Soviet and 1,000 German tanks, it does not mean that the battle of Prokhorovka was any less important or earth shattering in its consequences or the lives of its veterans. "Demolishing the Myth' is a book that was first released in Russian and written by Valeriy Zamulin. It was translated into English by Stuart Britton. Zamulin was a staff member of the Prokhorovka state museum, and has immersed himself deeply in the battle of July 12th. This is a book about that day, and the tremendous conflict that took place there. The book shows more light on the Soviet side, but is sweeping enough to keep you informed about what was happening on both sides of the war. There is some background given on the Soviet main force in the battle, the 5th Guards tank army, and its leader Pavel Rotmistrov. The reason for the battle of Kursk, the German plan, and the days from July 5th to the 11th are gone into, is to give the reader a good foundation of the facts leading to the clash on July 12th. The book itself is over six hundred pages long, and is well supplied with photos from the war. It also has a set of color photos taken to show how the battlefield looks today. The author has also liberally supplied the reader with tactical maps of the engagement. 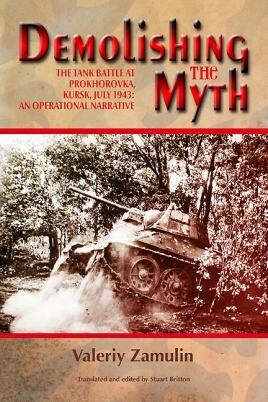 The book continues with an overview of the end of the battle of Kursk. One of the book's greatest assets is the numerous Soviet after battle assessments, and their conclusions on why the 5th Guards tank army was given a bloody nose by the SS panzer grenadier divisions. The hour by hour description of the battle is top notch. The book also comes with a complete Soviet and German order of battle and copious notes. The author brings up the fact, but does not belabor the point, that it is possible that an attack by the 5th Guards tank army should have happened at another site, and not straight into the SS panzer grenadiers. The possibility of using this large force in a flank attack would have brought the German attack to a stand still without the commiserate loss of vehicles and soldiers. The author also uses personal accounts to try and put the reader into the contestants' shoes. All in all, the book gives all the whys, and not just the facts of what happened. There have been numerous books written about the battle of Kursk. There are some with a Soviet slant and others that have a German one. With the fall of the Soviet Union and the ability of authors to view the official and non-official reports of the battle, we are now much better informed as to what really did take place. Helion and Company is to be heartily thanked and congratulated on this book. The information alone is worth the price, let alone the top notch physical components of the book. There are so many books on the market about Kursk that one cannot at this time say "this is the one book you need to understand Kursk", however I can state categorically that 'Demolishing the Myth' deserves a spot on your shelf.